If you were one of the people caught up with ‘The Russians are coming! The Russians are coming!’ and a selection of Cold War paranoia resurrected by politicians and the media, then surely recent news would make you start to think that this was a fake-news narrative? Ian56 on Twitter was recently named by the UK Government as a Russian bot, and Twitter temporarily suspended his account. He recently fronted up to the Murdoch Press’s Sky News, which a bot actually couldn’t. To be a Russian bot, you need to be (a) Russian and (b) a bot. The clue’s in the title. If the British Government would like to understand what a bot looks like, I can log in to my Facebook and send them a dozen to investigate. They are remarkably easy to find. It would be easy to identify bots on Twitter, but Twitter doesn’t like getting shown up. But Ian56 has never been caught up in that, because he’s human. His only “crime”, as far as I can see, is thinking for himself. Then he used his right to free speech to share those thoughts. He’s also British, and proud of his country—which is why he calls out what he sees are lies by his own government. And if there is hyperbole on his Twitter account, the ones which the Sky News talking heads tried to zing him with, it’s no worse than what you see on there every day by private citizens. If that’s all they could find out of Ian56’s 157,000 Tweets, then he’s actually doing better than the rest of us. We seem to be reaching an era where the establishment is upset that people have the right to free speech, but that is what all this technology has offered: democratization of communication. Something that certain media talking heads seem to get very offended by, too. Ian’s not alone, because Murdoch’s The Times is also peddling the Russian narrative and named a Finnish grandmother as a ‘Russian troll’ and part of a Russian disinformation machine. I’ve followed Citizen Halo for a long time, and she’s been perfectly open about her history. Her account was set up nine years ago, long before some of the Internet Research Agency’s social media activity was reported to have begun. She’s been anti-war since Vietnam, and her Tweets reflect that. While she sees no insult in being labelled Russian (she openly admits to some Russian ancestry) she takes exception at being called a troll, which she, again, isn’t. She also wasn’t ‘mobilised’ as The Times claims to spread news about the air strikes in Syria. She and Ian questioned the veracity of mainstream media views, and they certainly weren’t the only ones. They just happen to be very good at social media. That doesn’t make you part of a Russian disinformation machine. As a result of The Times’s article, Citizen Halo has gained a couple of thousand followers. Meanwhile, Craig Murray, who ‘went from being Britain’s youngest ambassador to being sacked for opposing the use of intelligence from torture’ also sees similar attacks in the UK, again through The Times. Inside there was a further two page attack on named academics who have the temerity to ask for evidence of government claims over Syria, including distinguished Professors Tim Hayward, Paul McKeigue and Piers Robinson. The Times also attacked named journalists and bloggers and, to top it off, finished with a column alleging collusion between Scottish nationalists and the Russian state. The government then issued a ridiculous press release branding decent people as “Russian bots” just for opposing British policy in Syria. In a piece of McCarthyism so macabre I cannot believe this is really happening, an apparently pleasant and normal man called Ian was grilled live on Murdoch’s Sky News, having been named by his own government as a Russian bot. The Guardian published the government line without question. It does appear that in 2018, all you need to do is think independently and exercise your right to free speech for the UK Government and the media to sell a conspiracy theory. That, if anything, begins weakening the official narrative. Like most people, I do take in some of the news that I get fed. Yet this activity is having the opposite effect of what the establishment wants, forcing tenuous links usually associated with gossip sites and tabloids. If you had trust in these institutions before, you may now rightly be questioning why. You have to wonder if the online census this year has been intentionally bad so that the powers that be can call it a flop and use it as an excuse to delay online voting, thereby disenfranchising younger voters. It’s the Sunday before the census and I await my access code: none was delivered, and I have three addresses at which this could be received (two entries to one dwelling, and a PO box). If it’s not at any of these, then that’s pretty poor. I have been giving them a chance on the expectation it would arrive, but now this is highly unlikely. And when you go to the website, they claim my browser’s incompatible. I disagree, since I’m within the parameters they state. This screen shot was taken after I filled out a request for the access code yesterday. Statistics NZ tells me the code will now take a week to arrive, four days after census night. Frankly, that’s not good enough. While I’ve seen some TV commercials for the census, I’ve seen no online advertising for it, and nothing in social media. My other half has seen no TVCs for it. Going up to the census people at the Newtown Fair today, I was handed a card with their telephone number and asked to call them tomorrow. You’d think they’d have people there at the weekend when we’re thinking about these things. Let’s hope I remember tomorrow. And I’m someone who cares about my civic duty here. What about all those who don’t? Are we going to see a record population drop? Same friends feeling disenfranchised for not having a computer. I understand reasons for online census but I think organisation and comms around it leave somewhat to be desired. So how many people on NZ Twitter have or haven't received their letter yet for Tuesday's Census? Third call to Census NZ about getting a form for another dwelling on the property. This is specifically a question they talk about on the letter we got with our code, but operators are unable to issue extra codes. The request goes up to the supervisor. When a field officer called around to give you a form, they sorted out issues like a second dwelling at the time, right there. They had authority to do so. They answered questions, and made sure you knew what you needed to do. Online systems are robust and can be successful. It’s just that they need to be backed up by people with a will to make things succeed, not people who are so intent on making them fail. A friend of mine, in the US, rightly questioned whether he could believe New Zealanders on this, because we have an interest in ensuring wool exports continue. PETA, meanwhile, is a non-profit set up for the welfare of animals. I’m glad he questions, because without people like him, we would be accepting things told to us via media without analysis. He is right to call me out on this. We should be doing it more often, in a civilized atmosphere. Putting aside first-hand eyewitness accounts of sheep-shearing, where are the interests? PETA’s interests include its US$51 million revenues (its own figures) and the US$47 million it says it needs to keep itself going each year. In comparison, the New Zealand Wool Board, which is part of the state and funded by a levy, lost NZ$270,000 according to its latest annual report, on revenues of NZ$11 million. Annual expenses are NZ$3 million. You can take the NZ numbers and shave roughly about a quarter off them to get US dollars. 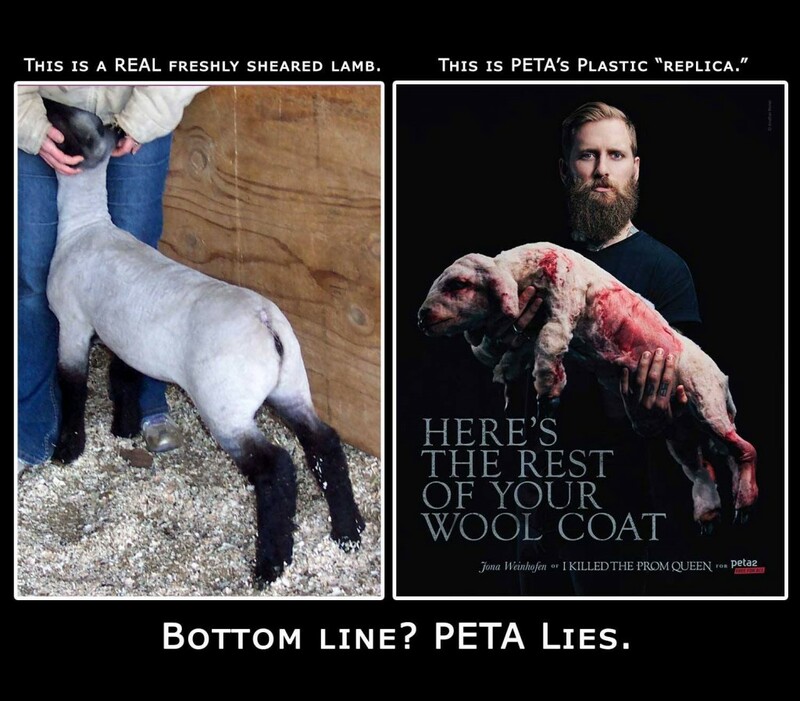 For our wool board to do our work and keep our wool industry going, it requires about 5 per cent of what PETA does per annum. What interests would be served by our wool industry if sheep were left in the state PETA claims is typical? None. It’s in the industry’s interests to make sure that the coat is shorn carefully so that the sheep can grow a new coat for the next season. The medical bills from having a sheep that badly injured would far outweigh anything a farmer could get from wool. Running PETA is an expensive business, even if it is a non-profit, and it relies on these campaigns to get contributions. I believe in animal welfare, and in many cases, PETA does a good job of highlighting important issues. We’ve even received a ‘Certificate of Appreciation’ from them for working with them on causes where we see eye to eye. But occasionally, you have to take its messaging with a grain of salt, and this appears to be one of those times. Polity has gone through the MFAT OIA documents relating to Judith Collins’s visit to China, where she met with Oravida thrice. I’ve been reading them but out of order (the second bunch only) and their summary of what I have read gels with my take on things. These matters have been covered better on political blogs, but I can’t but help drawing comparisons between the stubbornness of this government with the days of Neil Hamilton, Jonathan Aitken and others in the UK Conservatives in the 1990s. This Cabinet has opened itself up to media attacks because of the relatively large holes in its conduct, of which the above seems typical. And the PM makes one critical mistake here: he seems to portray social media as some sort of foreign world, where specialist knowledge is required. It’s certainly one that certain members of the old media fraternity love to use. The truth is social media aren’t that different: they are merely extensions of what one already knows. If you have been in business or in public service, you should know how to write and communicate. If you’re a reasonably competent writer in your everyday life, then it’s a cinch that you’ll be good at communicating with social media. I might get sucked in by the odd troll every now and then, but Twitter stress isn’t a valid enough excuse in my book. However, the PM is a smart guy. He knows that most of us will forget in a short space of time and there’ll be another scandal that will surface. So the disappearance of Collins through a time-out might be a good calculated move—at least that’s what he’s counting on. The problem with all of this is: where’s Labour, in the midst of the greatest gift an opposition has been given for years? One friend of a friend noted that maybe Labour shouldn’t be attacking, because we Kiwis don’t like whingers. It is the charge I hear from friends on the right. Labour should, instead, be coming up with solid policies and leave the attacks to the Greens (which is doing a marvellous job) and Winston Peters (need I say more? He remains a great political wordsmith). For me, I’d like them to do both if they are to stand a chance. The job of the Opposition is to oppose. And failure to oppose strongly may suggest to the electorate that the same thing could happen under Labour. Six months out from the election I contested, I had my policies published—which one blog noted was unusual but welcome. That meant my policies were out for twice as long as my opponents’. We’re talking about a party that has been in opposition for a long time, long enough to know what it wishes to do should it be handed the reins of government. It makes me wonder if Labour isn’t working and whether the anti-National vote will, indeed, head even more to the Greens this year. I signed up to the Igovt site for the New Zealand Government today, allowing citizens a single log-on for e-government services (such as the Companies’ Ofﬁce, where we have to ﬁle annual returns). In case you forget your password, you can choose from a variety of security questions they can ask you. The following examples are not what I wound up using, because on both occasions, Igovt would not allow the answer. The cheeky part of me thought, that since this was a site run by the state, only state schools were permitted. Now, I’m pretty sure that I know better than the New Zealand Government just where my Dad was born. Or, I thought, maybe they don’t let people with foreign-born fathers register? That you have had to have been here for a couple of generations. This was part of the Johnny Foreigner policies that someone inside the Department of Internal Affairs implemented. Seriously, I think the website has a problem with anyone who punctuates: the apostrophe and the comma were too confusing for it. I’ve written to the DIA to tell them of these bugs and, meanwhile, I’ve opted for some other question on the list. The answer for that question, sadly, is more ambiguous than the precise ones I required for my original choices, but I was running out of options. On a more pleasant note, the Igovt website is very nicely designed, and the new interface for the Companies’ Ofﬁce site is very attractive indeed. The facelift is long overdue, but I am very glad it’s come. Whomever did the redesign did a very good job. Meanwhile, I read that some documents, which weren’t exactly top secret but accessible to thousands of American civil servants, have made it on to Wikileaks. Good. Sometimes greater transparency is all our world needs, and the difference between what we had rumoured and what Wikileaks has revealed is that the new stuff has the stamp of approval of the US Government. I really don’t see various world leaders feeling upset at their perceptions as recorded by people inside the US. Most national leaders, one hopes, are not dummies, who will be more than aware of where they stand with the US. Now, had the documents been about aliens and UFOs, I would get excited. Funny how a media article can inspire you to send out a release, especially when you’re a ratepayer and you wonder if our City Council of élites understands how hard it was for us to make that money. In today’s case, it was Lindsay Shelton’s Scoop Wellington op-ed about Wellington City Council going nuts with its spending. Lindsay highlighted not only a $350,000 sculpture for the World Cup—money which I reckon we could use to boost the central city’s wiﬁ coverage—but Dave Burgess’s report in The Dominion Post that WCC spends six times as much as Porirua’s council on food and drink. I’m not sure how we can justify those sorts of numbers, but I do have an aim to balance the budget if elected. As I wrote today, if we can grow our creative and technological clusters in Wellington—and get free wiﬁ up and running (initially in the centre of the city, expanding outward)—we can grow the local economy and create jobs. After that we can look at partying—but not till we earn Wellingtonians’ respect by doing a bloody good job. A city that supports its clusters strategically will be able to balance the budget—and so far, it seems I’m the only candidate who is even willing to talk about this issue. We can start improving those communities through the new jobs we’ll be creating, and deal a blow to inner-city crime. If we fall behind on the tech side of things, consider this: we will lose the Sevens and any other event because our visitors will be asking, ‘Why can’t I get on to Google Maps on my iPhone without paying for it?’ It’s very simple, and when a mayor and council miss out on the simplest things, then it is time for a change. I would have thought a divided council—a complaint of the incumbent, Kerry Prendergast—would mean that we would not be spending massive amounts on things because there would be a lack of agreement. Spending ratepayers’ money, for some reason, seems to get rapid accord in this council—which tells me that when we vote in our mayor and council later in the year, we should have a far greater change than even I would have expected when I began my campaign. We have a divided council that needs firm direction on how to grow the economy, and a mayor who understands what ‘world-class city’ means. World-class does not mean big. World-class means nimble, modern and transparent. In 2010, we don’t need the same old, tired voices. Or the same old élites. The direction Wellington needs is a fresh one that brings new promises. Incidentally, we have added a Facebook widget for my campaign page on this blog. It’s been placed at a few locations on my sites. Also, as of today, backjack2010.com redirects to jackyanformayor.org—it’s important to have the consistency in the domain name and the campaign graphic (thanks to Demian Rosenblatt).